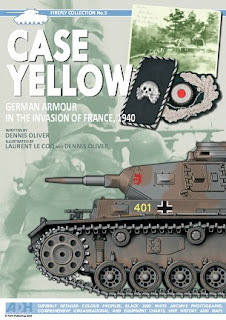 The Modelling News: Review: Oliver Publishing Group has some revelations in their new book on Case Yellow..
Review: Oliver Publishing Group has some revelations in their new book on Case Yellow..
Dennis Oliver makes some pretty popular books for WWII historians and modellers alike. Allied and Axis vehicles and campaigns are investigated under a microscope in only a relatively short space that these books afford the authors to convey the story. Thin in frame but large in info we always look forward to seeing them in the post – and this time the invasion of France by the German army is in focus..
Case Yellow: German Armour In The Invasion Of France, 1940 is a soft, glossy covered book of thirty four pages in A4 portrait format. The other Oliver publishing Groups books usually have a few pages of text before we get to profiles and all of the visual stuff. This is usually a bit packed with a few pages that turn out to be a lot of words as the font is small and there is much to read. This title is full of two (2) pages of text – well about one full page as the first two pages are dominated by a large map of France featuring the jump off areas of the German forces before the invasion. …And the bombshell is dropped straight away. The first page has a picture of Erwin Rommel – pretty standard - as well as a profile of a Panzer IV – again usual fare. The caption though tells us something we hadn’t heard of before – the myth of the “Single colour theory” of German vehicles in “Panzergrau” well it may not be as watertight as was once thought. This book shows many profiles of German armoured fighting vehicles with as they were – with camouflage colours and not one standard colour. Although I am sure there are some straight grey vehicles – many in fact in here – it does make you examine these pictures and the other ones you already have again.. There are several tables in this book which tell you the panzer strengths in 1940 as well as the layout of the Panzer organizational structure. There are fifteen pages in total devoted to two-a-page wartime shots. Several of these photos are from the author’s collection of unpublished shots and others seen before. They show us mostly a calamity of vehicles – mostly German vehicles tearing through French towns and villages or parked on the side of the road in a carpark like scenario waiting to get forward to the battle. Panzers of all different types from the early Panzer I – through Panzer II’s III’s and the Panzer IV , SPG’s like the Bison, StuG’s, cars and Mobile tracked 88mm guns as well as the licence made Panzer 38t’s are examined under a fine microscopic gaze. The single colour theory is put to the test right throughout this book. The author pointing out in the great supporting text that accompanies these shots. Some of the arguments are hard to debate as the authors have done their homework in reference work ( bibliography at the start of the book) and these pictures are spread through the title in amongst the other features. This isn’t a lone crusade though - There are thirteen pages of full colour artwork by Laurent Lecoq who contributed to the illustrations with nearly 40 different profiles of all of the early war German equipment I mentioned in the previous paragraph. The colour patterns are sometimes a little guessed at, but there are several pictures spread throughout these profiles which prove the markings and try to prove the camouflage rendered in these drawings. The profiles are of a great quality and valuable to the modeller who wants to try to think outside the box with something new. 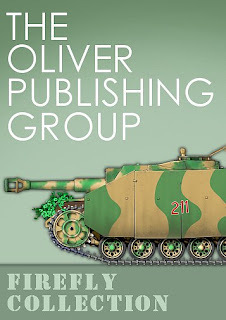 There are several helpful illustrations of the Runes and artwork found on these panzers which are great for modellers. The art in this book is a worthy addition and one of the party pieces of the title. Especially with the camouflage pattern shown. With the revelations in text on early German camouflage - to the supporting evidence in pictures that proves the author right, to the illustrated profiles clarifying and showing the modeller how to apply them, this is a book that modellers of the early panzers and some history buffs out there will really want to (and should) read at their first convenience.